Rubidium has applications in catalysis. Rubidium is the second most electropositive of the stable alkaline elements. It ignites sponta- neously in air and reacts violently with water, setting fire to the liberated hydrogen. Spectroscope inventors Gustav Robert Georg Kirchhoff and Robert Wilhelm Bunsen discovered the element in 1861. Its name comes from the latin rubidus, meaning deepest red, due to its bright red spectroscopic lines. 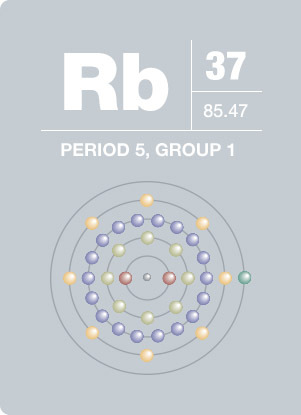 Although relatively rare, rubidium is the 16th most abundant element in the earth’s crust. It is far too reactive to be found as the free metal in nature. It occurs naturally in the minerals leucite, pollucite, and zinnwaldite, which contains traces of up to 1% of rubidium oxide.